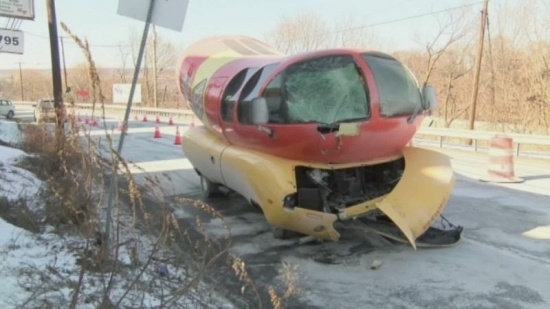 The Oscar Mayer Wienermobile crashed into a pole on Sunday in Central Pennsylvania. The iconic vehicle is one of 6 full size dogs in the Oscar Mayer fleet of promotional vehicles. The 27-foot hot dog in a bun slid off the icy road and hit a utility pole causing extensive front end damage and broken windshield. This all happened in Enola, Cumberland County, near Harrisburg. There were no injuries. On February 11, 2008, a Wienermobile suffered a similar fate in northern Pennsylvania outside of Mansfield, Tioga County, when it slid off of an icy Route 15, suffering minor damage. Police responded to a shooting this afternoon at a community center in New Castle, DE. The incident happened around 3 pm at the Rose Hill Community Center on Lambson Lane. A shooter ran into the building and opened fire, striking and killing a boy. The shooter then fled on foot. The building, which was filled with young people attending various programs, was put on lockdown for a while. Parent's were eventually able to reunite with their children. Police have no suspects at this point and are searching the area. They boy's identity and age have not been released. Grammy and Oscar nominated singer-songwriter Lesley Gore passed away Monday at age 68. Gore was best known for pop hits such as 1963's "It's My Party" and later hits “Judy's Turn to Cry,” “You Don't Own Me,” and "Sunshine, Lollipops and Rainbows." She was also nominated for an Academy Award for her work composing songs with her brother Michael for the 1980 film Fame. Over the years Gore has also appeared on screen in various television and movie roles. Her partner of 33 years, Lois Sasson, announced Gore's passing. She died of lung cancer at New York-Presbyterian Hospital in Manhattan. Winter Weather Advisory in effect until tomorrow at Noon for 3-6 inches of snow.